The roosters got the memo. I leaked tonight’s story last night, and I swear the obnoxious birds were on full offensive this morning. At quarter after 6 there must have been at least 4 of them camped outside my window, and almost as though in unison, they crowed their terrible call. There’s little in my house to absorb the sound; in fact the bare walls seem to amplify and echo the dreadful call. Usually it only takes one bird’s call to get me to spring out of bed and into action. It’s to the point now where I need only open my front door to make the chickens flee in fear. This morning’s coordinated attack had me in particularly angry, and they knew. But then they came back! They’ve never done that before. Usually if I throw one rock, that’s enough of a message. But today, no more than 10 minutes later, the same jerks were outside again, making my walls shake. My situation isn’t unique to Samoa. Loose chickens are a way of life on most family compounds. And since most schools have long-term residents, most schools have chickens too. My pule’s got pigs as well, but they’re of the penned-in variety. 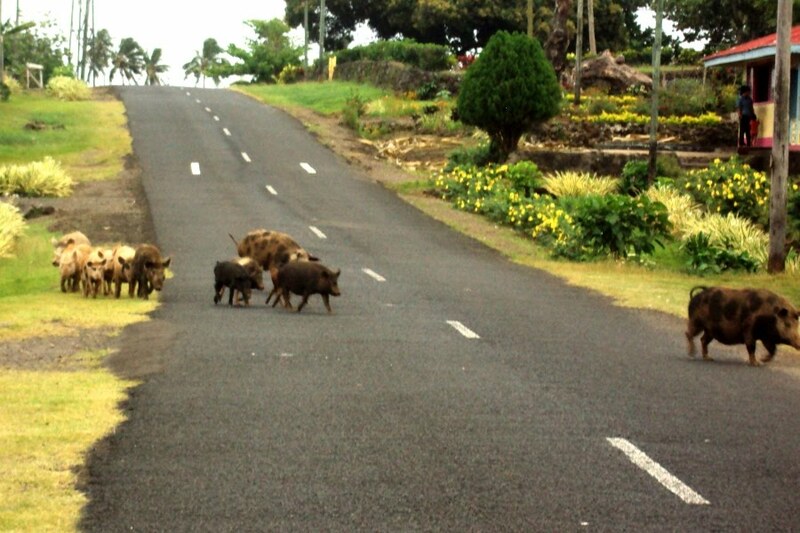 Driving around the island, pigs are everywhere, most of them on the loose, wandering about, digging up yards. I’ve never given in much thought, but I assume that’s why my pule keeps his in a pen: they’d wreck the rugby field if they got out. Pigs are a hot commodity in Samoa. They tend to be spoken of in terms of their size. Sizes range from 1 to 10, with 1 being little more than a piglet and a 10 being a full grown hog. Many size 2s lost their lives to Group 81’s 3-month village stay. Phil told me about how he likes to make a game out counting size 3 pigs when he’s bored on the bus. It’s a pretty big deal if you hit a pig while you’re driving. If you hit a pig it’s common courtesy to pull over and work it out with the pig’s owner. Either that or drive directly to the police station and turn yourself in. 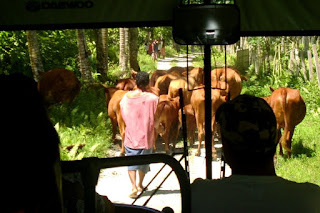 Horses and cows are less common in Samoa, but I see them occasionally. Since most families don’t have any fence to speak of horses and cows are usually tied to a post or a tree. Horses are used as pack animals carrying supplies to and from the taro plantation. I can’t say for sure, but I don’t recall ever seeing anyone ride a horse in Samoa. At my house in the training village, they name the pigs (before they eat them), but they always name them the same thing. 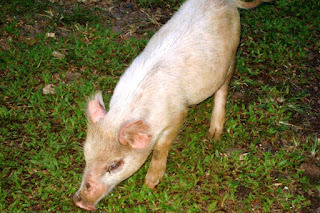 Large mother pigs are always called “Suka”, which means sugar. Younger male pigs are always called “Koli”. I’m unclear of the meaning there. Most families have a way of gathering the animals to be fed. My host family would drum on an empty cracker tin to get the chickens to congregate. Here on campus I heard my pule’s daughter doing a very melodious call. It was almost pretty. 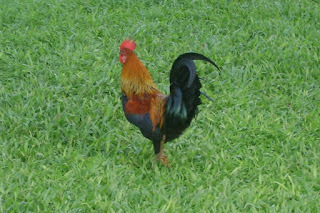 But then the roosters showed up. Tomorrow’s Cultural Exploration: O Words and A Words. During our first week of training, our bus had to wait behind this herd of cattle. One of the Kolis. It was ridiculously difficult to get this picture. Koli had escaped from his pen, and he wouldn't stand still long enough for a photo. 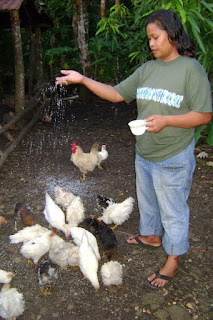 Asolima feeding the chickens. Doesn't the rice look cool? 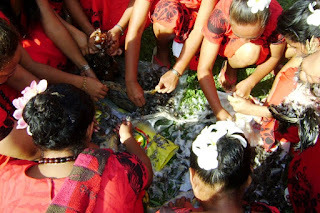 Plucking chickens at last year's Culture Day. 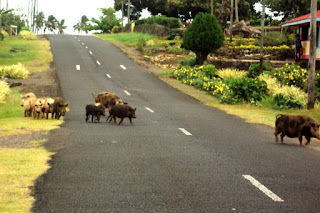 A family of pigs crosses the street during last year's perimeter run. What a coincidence! Dad and Uncle Louie went to the livestock auction yesterday and Uncle Louie bought 4 pigs. 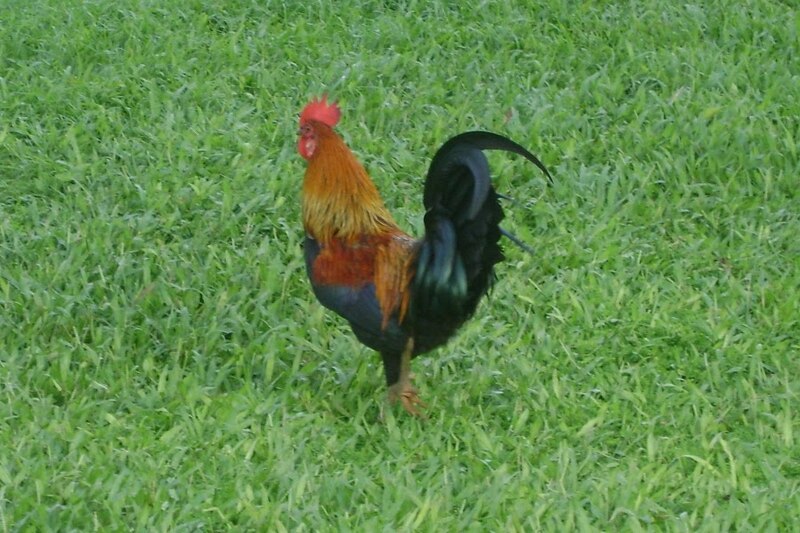 Dad said he almost bid on a rooster. Wouldn't that be a perfect welcome home gift for you! Koli - is usually short for Koliata. English translation: Goliath. I had a pig named after me once and sure enough it ended up on the dining room table for to'onai.